The decals are printed on a 7yr durable outdoor vinyl then coated with a layer of clear laminate on top to protect against the weather, fuel, & scratching and then die-cut. Decals shown do not include carbon fiber background. YOUR WATCHING FOR A VINYL DECAL STICKER:Instantly brighten and transform any room/car with these self-adhesive, removable, vinyl stickers. All about fish the healthy dish royal national lifeboat institution cookbook. All about fish the healthy dish royal national lifeboat institution cook book. Add me to your Favorite Sellers. A must-have reference for the wall of any fishing enthusiast! 11” Large Handmade Ceramic Novelty Accent Night Light Lamp Fish Angel Mod 70’s. Condition is used in excellent condition with no flaws that I can see. Free shipping and payment by PayPal. Thanks! Big Mouth Billy Bass Compatible W/Alexa Sings & Dances..Open Box. Box has been opened and zip ties on fish were broken. Power adapter is still tied in. Doesnt appear to ever been used! Some damahe to box on back but doesnt affect fish at all. See all pictures before buying. Billy Bass Big Mouth Wall Mount Singing Fish. The collection includes a 7oz. camo stainless-steel flask and a matching deck of Camo printed playing cards. Fits in any vest & jacket. Helpful Links. Daiwa Shoulder Pouch. Front pocket. Plier Holder. A set of 16 different and distinctive NOTE CARDS from images found inRare and Unusual Fly Tying Materials: A Natural History, Vol 1 Birds by Paul Schmookler & Ingrid Sils. Billy requires 4 "C" Batteries (not included). There are a few scratches on Billy's plaque. There are both in working order. They sing and move. Each fish has their own built in stand. I am not an expert on grading, nor do I claim to be. Giant Display Fishing Lure with real Treble Hooks. Solid wood, 18" Long, 2LBs. Daiwa One Shoulder Bag. Front pocket. Padded Back. Plier Holder. It is finished with a high gloss polyurethane paint to give it a wet look. This is a very heavy piece of art work item. Rapala Bottle opener. Start opening your award-winning brews with this award-winning opener based on the Original Floating® Rapala. Lenght 16 cm, weight 32 g.
New ListingBig Mouth Billy Bass Sings for the Holidays "Twas the Night Before Christmas"
This item has never been removed from it's box. The box isn't in perfect condition. This is almost as good as fruit cake as a gift. What is pictured is what you get so if you don't see it in the photos it is not included. 3 out of 5 stars - Big Mouth Billy Bass Sings for the Holidays "Twas the Night Before Christmas"
1 product rating1 product ratings - Big Mouth Billy Bass Sings for the Holidays "Twas the Night Before Christmas"
River's Edge 1783 LED Wall Art - Cabin with Deer 24"x16"
Manufacturer's Part Number: 1783. Operates on 2 AA batteries (Not included). LED and fiber optic illuminated features. Product Weight: 28 lbs. Size: 24" x 16" x 1" and ready to hang. We love the outdoors as much as you do. Decorative mini camo hats are ideal for Christmas trees, crafts, party decor, dolls, etc. Hard plastic form is covered in forest camouflage fabric with a black fabric inside. There is a twine hanger on the top which can be cut off if you don't need it. Penn Saltwater Angler Tackle Bag w/ 4 Tackle Boxes. PENN Saltwater Fishing Tackle Bag. The PENN Saltwater Tackle Bag was designed with tough in mind. The bag was specifically built to withstand the tough Australian Saltwater climate. Trending at C $82.90eBay determines this price through a machine-learned model of the product's sale prices within the last 90 days. Adjustable snap back One size fits most Comfortable, adjustable snap sizing makes this Eskimo Buffalo Plaid Hat the perfect year-round way to show your colors. The classic styling and construction of this cap is a tribute to the timeless tradition of ice fishing. 1999 Gemmy Big Mouth Billy Bass The Singing Sensation • Singing Fish • LN! 1999 Gemmy Big Mouth Billy Bass The Singing Sensation. Billy is in like New condition! Press red button on base! 4.5 out of 5 stars - 1999 Gemmy Big Mouth Billy Bass The Singing Sensation • Singing Fish • LN! 4 product ratings4 product ratings - 1999 Gemmy Big Mouth Billy Bass The Singing Sensation • Singing Fish • LN! On This Page you Can Bulk Buy our Flasher rigs at wholesale Price’s. Whiting Rigs fly Attracting materiel rig great for targeting King George, Sand whiting Flathead. The rig Very popular also when fishing from the beach. New old stock. Stored in a garage. Never used sold as is New 1998 Singing BIG MOUTH BILLY BASS Take me to the River Don't Worry be happy. Shipped with USPS Priority Mail. Trending at C $65.14eBay determines this price through a machine-learned model of the product's sale prices within the last 90 days. Trout Crossing Decal. 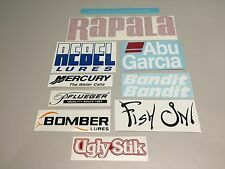 SignMission crossing Decals are crafted with treated inks that highlight its colors and image & are printed directly onto outdoor-durable Vinyl and then laminated making this Decal very scratch resistant. 2 Embroidered FISHING CLUB OF AMERICA FCA Patches Round - EX 3"